“You have only seen the beginning of the end.” A new sneak peek has been released for season five of the History TV series Vikings. 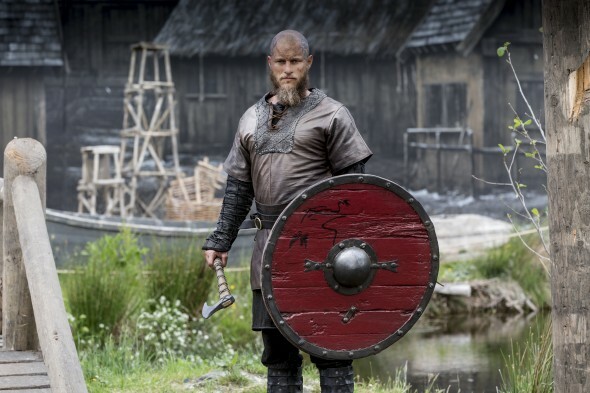 The historical drama follows Ragnar Lothbrok (Travis Fimmel), a Viking warrior and farmer who yearns to explore (and raid) the distant shores across the ocean. The cast also includes Katheryn Winnick, Clive Standen, Gustaf Skarsgård, Alyssa Sutherland, Linus Roache, and Alexander Ludwig. Season four of Vikings just ended on February 1st. History has not yet announced a premiere date for season five. What do you think? Do you watch Vikings? Did you like the season four finale? I truly love this series. Extremely informative and while I realize tht they are adding to, it is a wonderful series. Please do not cancel or if you do, let see what will bring it to the end. I am really hooked on this show. I was devastated when Ragnor died, but I truly liked the way he chose to finish his life. So Viking! I found the ending of the season to be a little confusing. It looked like the writer(s) couldn’t make up their minds if this was the end or not. I hope it continues. I am looking forward to seeing more of the sons and what happens to them and to Lagertha. The casting is great! Everything about this show is great. Love it. Absolutely love the series. Vikings is captivating and highly engaging with a well thought out script and strong cast. I particularly like the detail paid to early Scandinavian mythology and spiritulism that guided Viking society. In keeping with historical record, Viking women played prominent roles. The character of Lagertha isn’t too far from historical truth. Many excavated Scandinavian burial sites, long thought to contain men, were actually women who were ceremoniously buried with their weapons. As for Katherine Winnick, absolute perfection. He is a Bishop who will lead the resistance to Ivar, it’s been all over the blogs.